A complete meal and a house that stays cool. Isn't that what we all want in this heat? 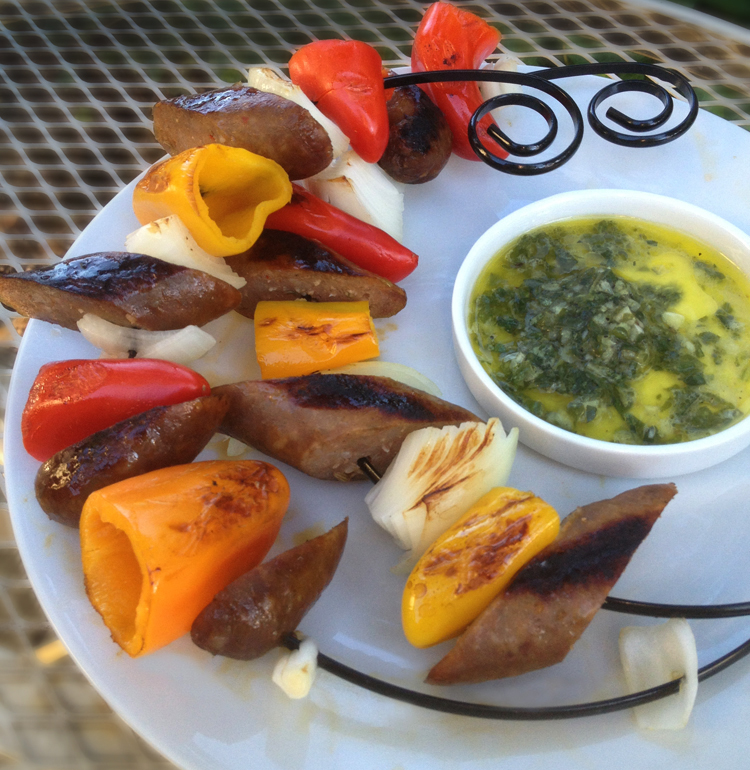 I had some Italian-style chicken sausage and some beautiful new circle kabobs that I'd never used and wanted to try. Blogging wasn't in the plan for this simple dinner but I decided to share some discoveries I made. SPOILER ALERT: The food was tasty, the circle kabobs were downright dangerous! The chicken sausage was good - not the same as traditional pork, but very flavorful and much lighter fare, perfect for hot weather. I served it with a basil dipping sauce that, after countless experimental batches, turned out blog-worthy. I posted it separately, the link is in the recipe. Now, take another look at those circle kabobs because they're the reason I'm writing today. What a presentation, huh? Worthy of the "Oohs!" and "Ahhs!" when you serve the meal. Well that, dear readers, is where the romance ends! They're sharp, slippery and unwieldy. I broke out a pair of brand new rubber gloves in a failed attempt to get a grip. Nothing short of pre-drilling holes in the food would have made that process easier (or safer). Eventually, the ingredients were impaled on the evil circles and ready for the grill. Which brings me to the next challenge - managing them over a fire. Trying to fit all four on the grill is quite a puzzle and the only way we could do it was to allow the ends to stack on top of each other. In theory that shouldn't be a problem but, in practice, they become entangled and, before you know it, you've got all four linked together over a fire. Turns out that's nowhere near as fun as it sounds! I was thinking about tossing them in the trash but now I think I'll re-purpose them into a wind chime or something I hang from my lilacs to keep the deer away! Back to the food. Sausage, peppers and onion. In our family these ingredients are the basis for traditional sausage and peppers in tomato sauce (a recipe for a cooler day). The sausage is usually pork, the peppers, green and the onion, yellow. For this Summer-time version I found organic mini peppers and I chose a sweet onion. Since the peppers and onions cook quickly on the grill, you'll want to pre-cook the sausage or use Andouille or another smoked sausage. I cooked the sausage the night before, when it was cooler. The biggest difference is the tomato sauce -- there is none. 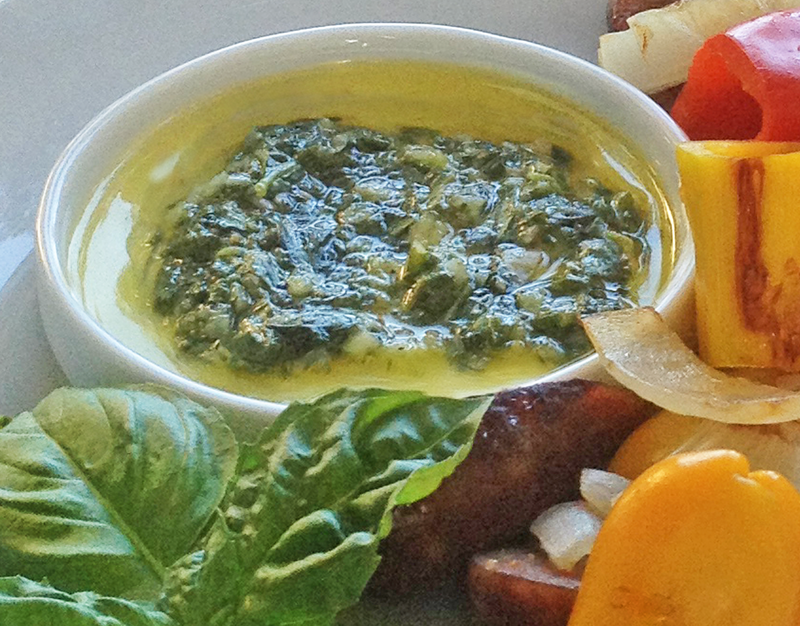 Instead, this no-cook basil dipping sauce was a nice compliment to the chicken. I hope you get some basic bamboo skewers and enjoy it! I love French fries. There, I said it. Now, what do I do about it? It doesn't matter if I make them at home or eat them out, they're made of carbohydrates, salt and fat. I left them behind (well, almost) in favor if the "side salad" years ago. Don't get me wrong, I like salads, but I miss fries. The flavor and crispiness; the way you can eat them with your hands. They're social food. "Want some of my fries?" Over the years I've tried baked "fries" but was still left with too many carbs and salt so I stopped doing that. Then I saw someone on television raving about portobello fries. After some research I came across a recipe for baked portobello "fries" that were coated in bread crumbs. I decided to try an old low-carb trick and replace most of the bread crumbs with dried onions. Before you say it, I know; onions are also carb-rich. But they're good carbs! If you read this blog often, you know that I love to experiment with seasonings. 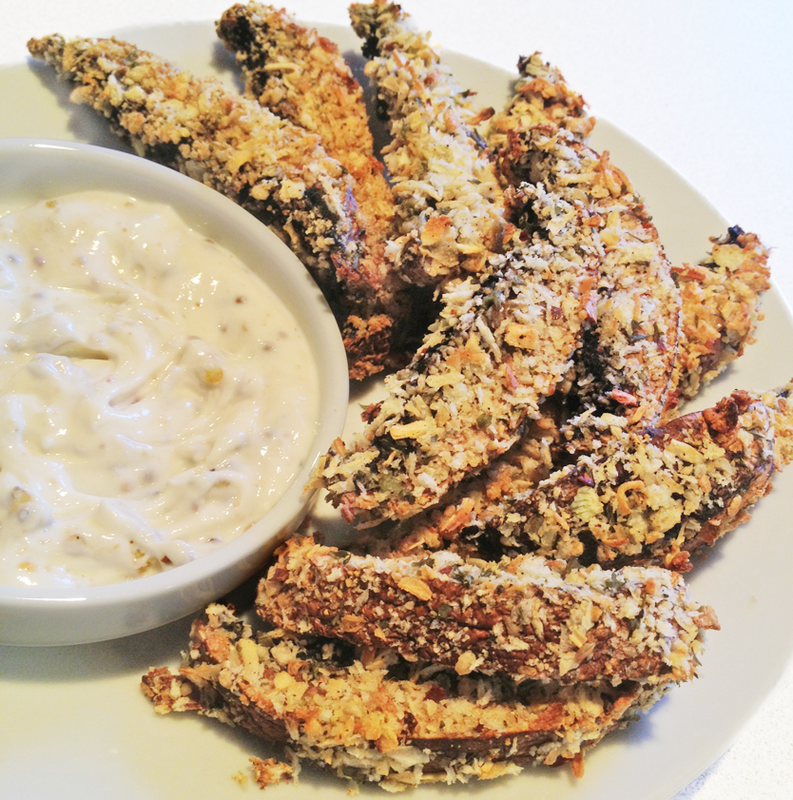 For this recipe I added a bit of curry and black pepper, then I served them with a yogurt dipping sauce. You'll be surprised at how quickly they go together -- and how quickly the disappear - truly fast food! I've decided that salads are the Summertime version of the casserole. Don't you agree? All of the ingredients are served in a single dish and you have complete control of the nutritional value of the meal. Even better, about 90 percent of the meal can be prepared ahead of time and that leaves more time to enjoy the warm weather and long Summer days. About month ago I made enchiladas and was inspired to transform the ingredients into a salad once it became too hot to turn on the oven. 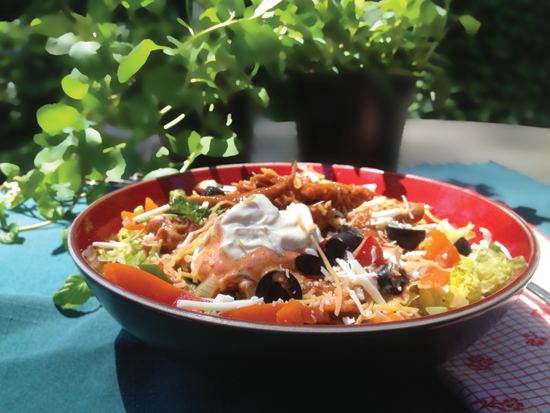 My challenge was to make a dressing that was appropriate for the enchilada-style salad. After getting really fancy with vinegars and seasoned oils (none of which reminded me of the enchilada flavor I wanted), I found a solution that was easier than I imagined. Remember when we used to make quick thousand island dressing by mixing ketchup and mayo? Well, I had some Sweet Creek organic enchilada sauce and some Nancy's sour cream in the fridge. It tasted great and it doesn't get any easier to make. I topped this salad with some chopped spicy almonds but you can also use tortilla chips or diced jicama to add a little crunch. Get creative! I've been waiting for that moment when I look at my herbs and there is finally enough to grab a handful and add them to my recipes! This has been a tough year for my potted plants. The deer that frequent my yard have been feasting on herbs that haven't interested them in years past. Replanted (again), this time with an obstacle course of patio furniture to ward off the deer, the garden is thriving and I'm enjoying the herbs in the kitchen now. I created this no-cook recipe with fresh oregano, garlic and basil thinking it would be best with some chicken sausage kabobs but have discovered that it's way more versatile. It's nice for a dipping sauce for bread, a dressing for shrimp salad and even a marinade for chicken or fish. If you like the tang of fresh lemon and herbs and the slight bite of raw garlic, this one's for you! In fact, you might be surprised at the different ways your family and friends use this.